Most leaders know that a winning, engaged culture is the key to attracting top talent--and customers. Yet, it remains elusive "how" exactly to create this ideal workplace --one where everyone from the front lines to the board room knows the company's values and feels comfortable and empowered to act on them. 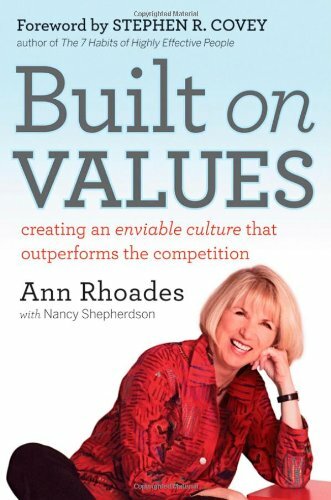 Based on Ann Rhoades' years of experience with JetBlue, Southwest, and other companies known for their trailblazing corporate cultures, "Built on Values" reveals exactly "how" leaders can create winning environments that allow their employees and their companies to thrive. Companies that create or improve values-based cultures can become higher performers, both in customer and employee satisfaction and financial return, as proven by Rhoades' work with JetBlue, Southwest Airlines, Disney, Loma Linda University Hospitals, Doubletree Hotels, Juniper Networks, and P.F. Chang's China Bistros. "Built on Values" helps companies get on the pathway to greatness by showing the exact steps for either curing an ailing company culture or creating a new one from scratch.